"Flotilla incident", "Gaza", "IP", "Israel", "Middle East", "Palestine"
I have often gotten into trouble with people generally on my side of the political spectrum for being a staunch and unapologetic supporter of Israel (please note that unapologetic support does not mean 'apologist'). I generally have not posted my thoughts on the Israeli-Palestinian issue on this blog both because I am not a middle east expert and because it is the most divisive of issues - those who are outspoken tend to be on one side or the other, and tend not to ever listen to anything - including facts - contrary to their view. The "liberate Palestine" side of the debate excuses and often ignores the existential threat that Israel faces from terrorist organizations and hostile states. Super-partisan supporters of Israel are often oblivious to the plight of the Palestinian people and the need for a truly free, two-state solution. As I said, I am a supporter of Israel's. But I am not hyperpartisan. I acknowledge on the outset that violence has been fueled on both sides - and politically exploited on both sides. But let's turn to the specific incident that has the attention of the International community now: the Flotilla incident, in which, if all you heard was TV reports and main stream media reports, Israeli commandos boarded a supply ship bound for Gaza and shot 9 activists dead. Before I go any further, though, I want to separate the questions of whether the blockade itself is justified and whether we are given full information to make a complete judgment on what actually happened in this incident on this specific ship. Just as a perceived legal blockade alone does not give justification to use of lethal force, so a perceived illegal blockade does not negate a soldier's prerogative to use force in defense. Watch it carefully. Strip out the opinions, but look at the strict facts presented. What are they? First, the Israeli Navy warned the flotilla as they were approaching the blockade. The boarding of the ships did not come suddenly. Secondly, five of the six ships were boarded without incident. This is significant. Why were five ships boarded peacefully but not the 6th? Was it a different military handling the 6th ship? No. It was, however, sponsored by a particular group. Mavi Marmara - the ship where the 9 people were killed, was sponsored by the Turkish group IHH. Who are the IHH? Now on the Israeli terrorist groups list and under consideration to be on its counterpart in the US, IHH has supported Hamas. This isn't just the Israelis telling us that. Former French anti-terroris magistrate Jean-Louis Bruguière and international terrorism consultant Evan Kohlmann concur. IHH itself openly associates with Hamas, as I will show below by several screen-shots from IHH's own web site (if you want to see the actual content on their site, go to the IHH Wikipedia entry, then click on their website, and do a search for 'Hamas.'). 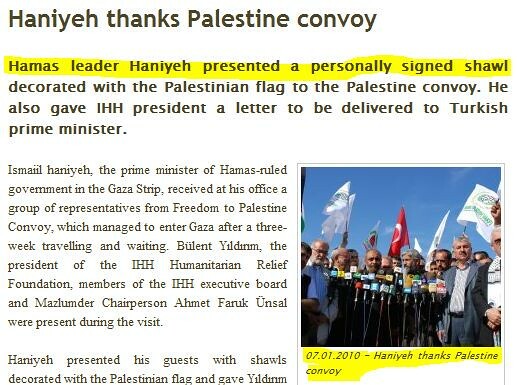 As you can see, IHH openly celebrates Hamas' endorsement on their own web site. Some "humanitarian" group. Not only do they celebrate Hamas' endorsement, favors flow the other way too. 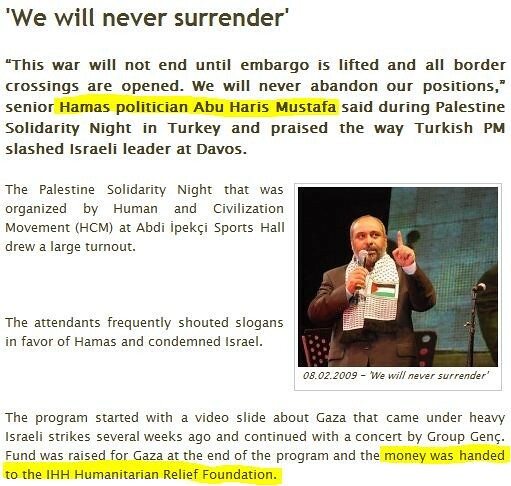 The IHH also boasts proudly on their web site a fund-raising event in which Hamas participated and money was handed to IHH (their words, not mine). Let me show you what I'm talking about. Did you hear this stuff from your TV news outlet? I bet you didn't. As the video also clearly shows, members of IHH boarded Mavi Marmara were quoted to have boarded the boat having written their last will and testament, and one member could be seen wearing a martyr outfit. An Yemeni doctor quoted the Flotilla commander to have said, "As much as they want to reach Gaza, martyrdom is more desirable." You can see "activists" on the Mavi Marmara on video chanting battle crys celebrating the Battle of Hybar, where Muhammed's army slaughtered an Arabian Jewish tribe. Given all this, is Israel's decision to board the Flotilla entirely unjustified? I don't think so. You can obviously also see people on the ship assaulting Israeli soldiers as they board the ship one by one. Soldiers usually are not in a mood to just lie there and get beaten up if you are assaulting them. We can of course argue whether lethal force was an appropriate response, however, no one should argue that use of some force wasn't justified. I have often thought about it this way: if you were constantly attacked by stones, metal rods and broken bottles (but not firearms) and did not have the police to call but had a firearm, would you be justified in picking it up and shooting at your attackers? Even if some of them die? Speaking of whether any use of force was justified, here is another video - this one elaborates and shows the specific communication from the Israeli Navy to Mavi Marmara before the incident, as well as shows the "peaceful activists" on the ship throwing stunt grenades. Again, take out the opinions presented, but do look at the facts you see on this video. Does this look like a group of peaceful humanitarians to you? June 3 (Bloomberg) -- Hamas refused to accept an Israeli delivery of at least 20 truckloads of humanitarian aid from the flotilla of ships that commandos intercepted in a raid that left nine people dead. Hamas officials in the Gaza Strip and Israel’s Defense Ministry said today the cargo, including medical supplies, clothing, blankets and toys, was held up at the Kerem Shalom crossing after being brought 38 kilometers (23.6 miles) south from the port in Ashdod. Hamas said it wouldn’t take the aid because Israel confiscated some of the supplies and was still holding some of the more than 700 passengers involved in the May 31 attempt to break Israel’s naval blockade of Gaza. Israel said last night it had expelled all foreigners from the ships except for seven who are hospitalized. As a result, the UN had to step in and take over the delivery of the goods, causing a completely avoidable delay of more than two weeks. Who exactly is responsible in this instance for the suffering of the Palestinians to whom aid could have gotten two weeks earlier? Is what I have said above all the facts? I don't know. But what I have presented are certainly accounts that are not widely known, or covered by the fly-by media of our time. My goal is to present these facts - yes, admittedly in favor of Israel, but also to bring to light things that have been missed by the mainstream press. There is an investigation - that will include two international observers to ensure fairness - under way in Israel to discover all the facts. The White House has endorsed this approach, and urged for expediency. When the report comes out - in light of facts - all the facts - we will be able to judge things better. But as we stand right now, I do not see things as many are quick to. As things stand now, my judgment leans in Israel's favor.